Bergenfield, November 3 rd , 2017 – Nova Electric introduced a line of 1KVA to 5KVA UPS and Frequency Converters in a transit case. The size of the transit cases are determined for each UPS size, be it 1U, 2U, 3U, 4U or 5U. The UPS as well as the transit case are very light, rugged construction and suitable for helicopter drop. 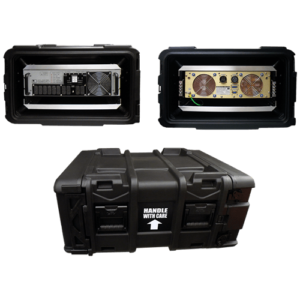 The transit case provides maximum protection against rain, sand, and rough transport in ground or airborne vehicles with full protection. The Nova UPS can be left in the case and be operated on site or it can be removed and mounted permanently in a 19” rack enclosure. Available UPS’s in this series start at 1KVA and the highest power is 5KVA. The same range for frequency converters.